Week ahead: Will a government shutdown delay jobs report? Usually, a jobs report week dominates investor psyche, but this week is different. As traders turn on their computers Sunday night when Asian markets open, they will have to decide whether or not Congressional paralysis will shut down the government as of Monday night at midnight. 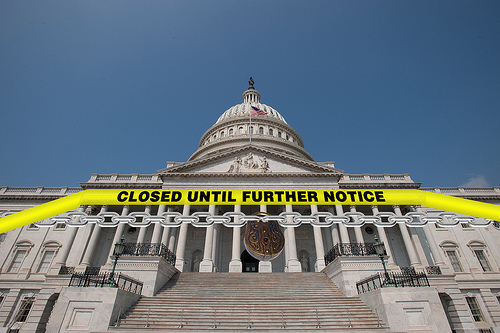 Most analysts believe that a short shutdown will not derail the economy, unless of course you are not deemed an “excepted” or “emergency” federal worker (note: the word “essential” seems to be very un-PC this time around) and would are put on unpaid leave. If that’s the case, any shutdown will be significant to your life. If the government were to shut down, here’s what will NOT be immediately affected: Social Security payments, Medicare, air-traffic control, immigration, border security, emergency and disaster assistance, federal law enforcement, IRS processing of electronic returns and payments, mail delivery and active-duty military will keep working, but will NOT get paid until the funds are available. A government shut down would shutter national parks, federally funded museums (including the Smithsonian), the National Zoo, all federal government websites (including the popular Panda Cam! ), research by Health and Human Services, grant applications, new applications for Social Security, IRS walk-in centers, federal loan applications for small businesses, college tuition, or mortgages, Library of Congress buildings, events and web sites and potentially, the government of the District itself. None of this would deal with the implications of hitting the nation’s borrowing limit - the debt ceiling. We have three weeks to deal with that issue, so don’t fret – here's a cheat sheet “Debt Ceiling, Part Deux,” which will help you brush up on your debt, deficit and debt ceiling facts. If the government were to shut down, it may delay the Friday release of the September employment report. (Although we think the folks at the Bureau of Labor Statistics are important, Treasury Secretary Jack Lew might not agree.) This report could be pivotal. The big questions is: were the past three punk employment reports, (monthly job creation at just under 150,000, lower than the 180,000 average seen in 2013) a temporary pullback, or the sign of a more worrisome trend? Economists predict that the September report will be more in line with this year’s 180,000 pace because recent data have shown that the labor market has been improving. (Employment reports from the Institute for Supply Management have gained ground and weekly jobless claims have dropped to the lowest level since June 2007.) The unemployment rate should remain at 7.3 percent. MARKETS: “October. This is one of the peculiarly dangerous months to speculate in stocks…the others are July, January, September, April, November, May, March, June, December, August and February.” Mark Twain may have be on to something. Five of the 10 worst percentage losses since the Dow’s inception have occurred in October and the month claims the top three worst days ever: 10/19/87 (-22.61%), 10/28/29 (-12.82%) and 10/29/29 (-11.73%). This does not mean that investors should sell everything and run for the hills, but it’s just a reminder that with stock indexes up nearly 20 percent for the year as we enter the spooky month of October, there’s a lot going on that could cause a reversal of fortune for investors.